Looking for new books to read this year? 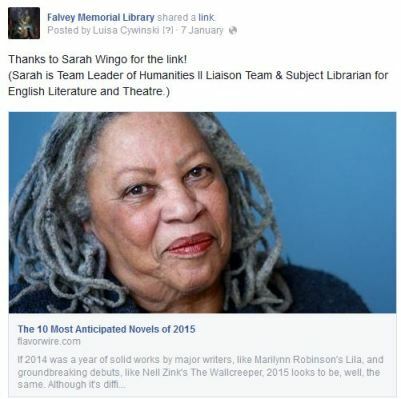 Sarah Wingo has got you covered with this link to Flavorwire. Follow us on Facebook for library news, events, items of interest, and the occasional bit of trivia from other sources. Did you catch the Pew Research report released this week that once again crowns Facebook as the #1 most used social media site in the US? You’ll see that its growth is quite flat, however, when compared to other platforms such as Instagram, Pinterest and LinkedIn, which are growing at a much faster percentage. We wonder, what’s the next big thing? Which are your go-to platforms? Don’t forget, you’ll find a Falvey Memorial Account on just about all your favorites. Have you ever stopped to order boots or check your Facebook status in the middle of an exciting novel? If so, then we bet you were reading it on an e-reader. Is it too easy to jump ship and multitask instead of concentrating on the great books? Naomi S. Baron of the Washington Post thinks so.